The Command card system drives movement, creates “fog of war”, and presents players with many interesting challenges and opportunities, while the battle dice resolve combat quickly and efficiently. The battlefield tactics you will need to execute to gain victory conform remarkably well to the strengths and limitations of the various ancient unit types, their weapons, the terrain, and history. In this core game of the series, we focus on battles involving Rome and Carthage, with a few additional scenarios that pit Carthage against other historic enemies. Additional expansion modules are available to cover battles of Greeks, various Eastern Kingdoms, Gauls, Celts, and many other situations, from the struggles among Alexander’s Successors to the many civil wars Rome was involved in. You will need this game in order to play any of the expansions. 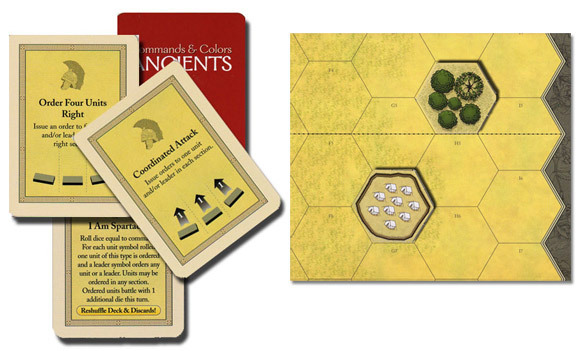 Add a Review for "Commands and Colors: Ancients"